Mark Buckley is the recipient of the Martindale-Hubbell Client Distinction Award. The Martindale-Hubbell® Client Distinction Award is based on Client Review Ratings in the categories of communications ability, responsiveness, quality of service, and value for money. 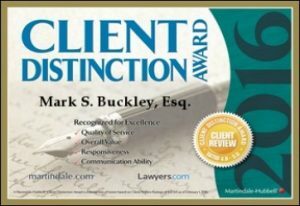 The results have been compiled and Attorney Mark Buckley has earned a Client Review Rating Score of 4.5 or higher on a scale of 1-5. Less than 1% of the 900,000+ attorneys listed on martindale.com and lawyers.com have been accorded this Martindale-Hubbell honor of distinction.